Comedy superstar Adam Sandler is back - and funnier than ever - as The Zohan, the finest counterterrorist agent the Israeli army has. That is, until he fakes his death and travels to Manhattan to live his dream ... as a hairdresser. Now this skilled fighting machine who used to clip bad guys is out to prove he can make the cut as a top stylist. All goes silky smooth until his cover is blown when he's recognized by a Palestinian cab driver (Rob Schneider). Now, The Zohan must fight to live a peaceful new life in New York in this razor-sharp action-packed comedy from Adam Sandler, Robert Smigel, Judd Apatow and Dennis Dugan. $38.531 million on 3462 screens. Adam Sandler scored yet another summer hit with 2008’s You Don’t Mess With the Zohan. In this broad comedy, Sandler plays Israeli counter-terrorist agent Zohan Dvir, the hottest thing their forces can boast. Whenever an impossible situation arises, the authorities call on “The Zohan” to solve the problem. Unfortunately, he tires of this life. Instead, he dreams that he’ll move to America and become a hairdresser. Unfortunately, his parents mock this desire and leave him despondent. But not for long. After an encounter with a notorious Palestinian terrorist named The Phantom (John Turturro), Zohan fakes his own death. From there he escapes to New York so he can pursue his hairdressing career. The film follows his adventures in styling, his personal relationships, and complications that connect to his prior life. Virtually every time I review a Sandler movie, I remind the reader that I maintain an inherent affection for the actor. I liked him back in his SNL days, and I enjoyed his first big solo flick – 1995’s Billy Madison - quite a lot. Since then, however, Sandler has proved inconsistent, to say the least. For every good movie like 50 First Dates or Mr. 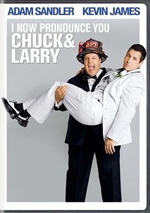 Deeds, we get stinkers such as Click or I Now Pronounce You Chuck and Larry. Coming hot on the heels of Larry, I expected Mess to be another dud. Not only did it bring back Larry director Dennis Dugan, but also it just looked lame. Sandler as an Israeli counter-terrorist turned hairdresser? Pass! Which I did – I skipped the movie in theaters and waited for the DVD. To my pleasant surprise, Mess provides a reasonably likable and entertaining experience. I’m starting to think the main difference in the quality of Sandler flicks relates to the charm exhibited by his character. When he plays a pleasant character like Deeds or Dates’ Henry, the film works. When he plays someone abrasive and arrogant as in Larry or Big Daddy - another Dugan effort, by the way – I find it much more difficult to tolerate his work. Though the superhuman Zohan probably should’ve been intolerable, Sandler gives him an unassuming side that makes him likable. Despite all the character’s powers, he never behaves in an obnoxious or arrogant manner. Instead, he stays a charming mensch who endears himself to the audience. And that makes a huge difference. Some actors can play unlikable characters who nonetheless prove enjoyable, but that doesn’t hold true for Sandler. Except for maybe Billy Madison, he can’t take a jerk and execute the transition to nice guy. His characters remains too abrasive that the shift doesn’t work, so Sandler seems most enjoyable when his roles start – and stay – likable. The over the top absurdity of Mess also helps make it succeed. This is cartoon action straight out of Looney Tunes. When scenes feature characters walking on ceilings, swimming like dolphins and batting about grenades with Ping-Pong paddles, you know the movie embraces the silly side of life. Because it never attempts to seem realistic, the gags work, and they lend the flick a goofy tone that creates laughs. From start to finish, the movie teeters on the border of offensiveness. Given its spotlight on Middle Eastern stereotypes, it could – and probably should – have been a disaster. However, Mess boasts such a good spirit that it never feels offensive. It doesn’t seem mean-spirited because it’s not. The movie pokes fun at standard depictions of Middle Eastern characters but doesn’t do so in a crude, nasty manner. Instead, it has fun with the roles and tries to sell a message of love and brotherhood. I’m not sure it pulls that off, but I don’t recall any controversy over the film’s portrayals, so I guess it didn’t offend anyone. Of all the actors, Turturro deserves particular mention. For some reason, I usually don’t like him a lot, but he always proves hilarious in Sandler flicks. That happens again here, as his Phantom is a ridiculous delight. Turturro so heavily buys into the cartoon spirit of the movie that he adds terrific gusto to his character. Despite the Phantom’s limited screentime, I’ll bet Turturro produces half the film’s laughs. At no point does Mess threaten to become a classic, and at 117 minutes, it almost overstays its welcome. That said, I can’t think of much that should’ve been cut, and the material onscreen offers a good number of laughs. The movie does its job and entertains most of the time. 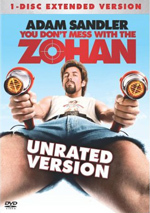 You Don’t Mess With the Zohan appears in an aspect ratio of approximately 1.85:1 on this single-sided, double-layered DVD; the image has been enhanced for 16X9 televisions. The transfer offered a consistently positive affair. Sharpness seemed solid. A few wide shots looked slightly soft at times, but those remained in the minority. Most of the flick looked crisp and well-defined. I saw no issues with jagged edges or shimmering, and edge enhancement appeared absent. No source flaws cropped up either. In terms of colors, the flick went with a moderately subdued set of tones. Hues stayed on the natural side, with a mild golden tint to things. Within those parameters, the tones looked fine. Blacks were dark and firm, while shadows appeared clear and well-developed. The image didn’t really excel, but it was good. I felt the Dolby Digital 5.1 soundtrack of Mess offered an occasionally involving effort. The smattering of action sequences brought the five channels to life. These presented good localization of elements and blended together nicely. The material spread out the spectrum and made this an active setting at times, though most of the flick stayed with music and general ambience. Audio quality appeared good. Speech sounded distinct and natural, and I encountered no concerns related to intelligibility or edginess. Effects appeared clean and accurate, and they showed reasonable depth when necessary. Music also demonstrated good dynamics, with bright highs and rich bass. Overall, the audio of Mess supported the material well. When we head to the set’s extras, we open with two separate audio commentaries. The first comes from director Dennis Dugan. He presents a running, screen-specific chat that looks at locations and sets, cast and performances, action and stunts, effects, and a few other areas. Dugan offers a decent examination of the film, though he tends to sag as the track progresses. He jokes too much and doesn’t give us a ton of great facts, but he covers the movie in an acceptable manner. For the second commentary, we hear from actor/writer/producer Adam Sandler, writer/producer Robert Smigel, and actors Nick Swardson and Rob Schneider. All four sit together for this running, screen-specific piece. A lot of joking materializes here along with general notes about cast and performances, locations, and some other issues. Much of the time the participants tell us who came up with particular gags, and they also simply name folks as they appear. This becomes a very screen-specific affair, and not one that really flies. It keeps us reasonably engaged, and we find some decent thoughts about the movie’s pre-9/11 origins, but it doesn’t provide a great number of useful facts. A whopping 10 featurettes appear. These run a total of one hour, six minutes and six seconds, and include “Look Who Stopped By”, “Dugan: The Hands-On Director”, “The Stunts of Zohan, “Dugan Espanol?”, “Zohan Vs. the Phantom”, “Shooting Baja for Tel Aviv”, “All-American Redneck”, “From Guns to Scissors”, “The Robot” and “Laughing Is Contagious”. Across these pieces, we get comments from Dugan, Sandler, Schneider, Smigel, stunt coordinator Scott Rogers, production designer Perry Blake, location manager Robert Frank, and actors Sid Ganis, Kevin Nealon, Michael Buffer, John Paul DeJoria, Henry Winkler, Emmanuelle Chriqui, John Turturro, Ido Mosseri, Daoud Heidami, Sayed Badreya and Dave Matthews. The shorts look at cameos, Dugan’s work on the shoot, stunts, location shooting, relations among Israelis and Arabs on the set, a deleted subplot and bloopers. I expected these clips to be short and puffy. That assumption occasionally holds true, but they often offer more than that. We get plenty of great shots from the set; the “Stunts” featurette proves especially intriguing in that regard, as it gives us a great look at how the filmmakers executed the various challenges. “Scissors” gives us a surprisingly deep look at the way the movie’s actors dealt with political differences, and other pieces threw out many nice notes. You’ll still find some fluff and silliness, but the featurettes usually work quite well. 15 Deleted Scenes last a total of 13 minutes, 47 seconds. As you can tell from that running time, most of these offer brief bits; those tend to extend existing scenes. Some of those are pretty good, like when we get a little more of the Phantom’s Rocky-style training. We also find some interaction between John McEnroe and the Phantom that entertains. As for totally new bits, I like the little shot of “Zohan’s Funeral”; it wouldn’t have fit neatly into the flick, but it’s interesting. I also like a scene when the Palestinians try to get one of their daughters to help them find out how to build a bomb. Overall, the deleted scenes include quite a few amusing pieces. The DVD opens with a few ads. We get promos for The House Bunny, Quantum of Solace, and Hancock. These also appear in the Previews area. No trailer for Mess appears here. Forgive me if I didn’t expect much from Don’t Mess With the Zohan, as a few straight years of poor Adam Sandler movies made me figure he’d lost his skills. Happily, Mess provides a pretty entertaining affair. It’s so zany and over the top that it turns into a witty cartoon come to life. The DVD gives us good picture and audio along with a nice collection of extras. Sandler fans should dig this amusing effort.